Snow and ice accumulation can do serious damage to your awning, so make sure it is always kept clean! Protecting your entryway or deck from harsh winter weather offers both convenience and safety to visitors and patrons. However, you cannot simply install an awning and ignore it through sleet and snow. You must regularly clear an awning of snow and ice to keep it safe and functional for years to come. When an awning becomes burdened with excessive weight it not only becomes a safety hazard, but can also damage your awning. 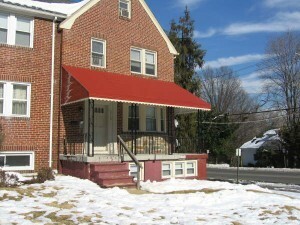 Large amounts of snow and ice can cause your awning to snap and fall unexpectedly. Unfortunately, it might even fall on whoever is standing under it. Here are some tools you can use to get rid of this excess snow and ice. Snow brooms are like push brooms and have extendable handles. They have soft bristles which remove winter precipitation without damaging your awning. Snow brooms should be stored indoors to prevent the soft bristles from freezing with snow and becoming hard and caked with ice. When this happens, the broom can damage awnings. These are easy to use tools for removing snow off of awnings. While these work wonders on light fluffy snow, if it has become heavy or wet the leaf blower will not work very well. Also, leaf blowers blow snow in all directions, and may possibly lead to a larger cleanup than would be required if other snow removal tools were utilized. Roof rakes are effective tools, but should only be used on certain types of awning fabric. Only use roof rakes on aluminum or metal awnings. At the end of a roof rake is a flat aluminum piece which can scratch or rip fabric or wood awnings. Even when used on aluminum or metal, care should be taken not to scratch or gouge the surface of the awning.